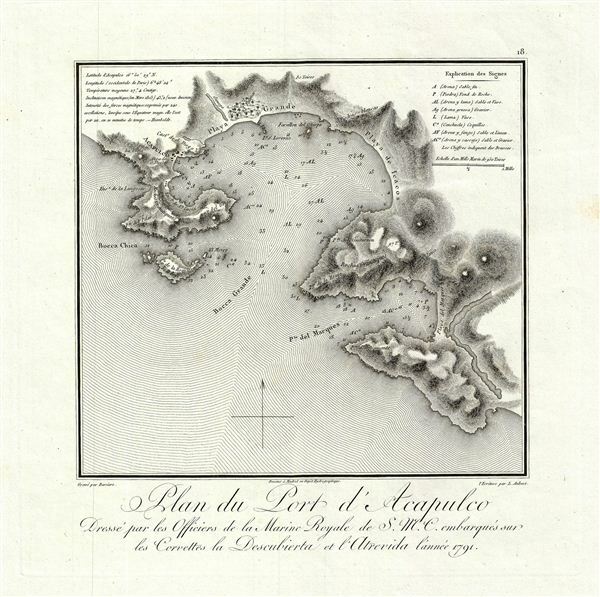 Plan du Port d'Acapulco Dresse par les Officiers de la Marine Royale de S.M.C. embarques sur les Corvettes la Descubierta et l'Atrevida lannee 1791. A stunning example of Alexander von Humboldt's 1811 map of the port of Acapulco. This map was drawn to accompany Humboldt's important essai politique sur le Royaume de la Nouvelle-espagne, one of the most influential books written about late colonial period Mexico. It covers Acapulco Bay and the adjacent and smaller Marques Port. Humboldt compiled this map from earlier maps prepared by the Spanish Royal Navy in 1791. The map, like of Humboldt's cartographic work, advances over earlier mapping of the region by virtue of incorporating Humboldt's vast knowledge of cartography and geology. The map was engraved by L. Aubert and printed by Barriere in Paris, 1811. Humboldt, A., Atlas Geographique Et Physique Du Royaume De La Nouvelle-Espagne, Fonde Sur Des Observations Astronomiques, Des Mesures Trigonometriques Et Des Nivellemens Barometriques., (Paris) 1811. Very good. A near flawless example with vast (about 8 inchs) margins all around.